It's been a while since we've hit up nature for some fresh air and spaciousness. Friday night we made a quick plan to go to Waterton Lakes National Park. Saturday morning we packed into the truck for its superior all-wheel drive capabilities and went on a road trip. Brittany and I had Waterton on our list of places to visit and it was finally happening. We ignored the wind warning and ventured forth. The drive from Calgary to Waterton is about three hours but there are a handful of lookouts along the way where you can take a break from driving and stretch. One particular lookout just outside the entrance to Waterton Lakes National Park had a great view of a group of mountains. The wind was eroding the layer of snow at their peaks. The toll booths leading into the park were abandoned and the road to the Prince of Wales hotel wasn't plowed. The whole thing had an eerie Shining vibe to it. Thankfully the snow wasn't deep and we all had boots so we made our way to the top of the hill. The wind was much stronger around the hotel. We were all having fun leaning into it and letting it push us around. These were definitely newscaster-reporting-on-impending-hurricane winds. Mum fell over near the top of the hill and Levi had to bail after he started running and couldn't stop. Our next stop was Cameron Falls. 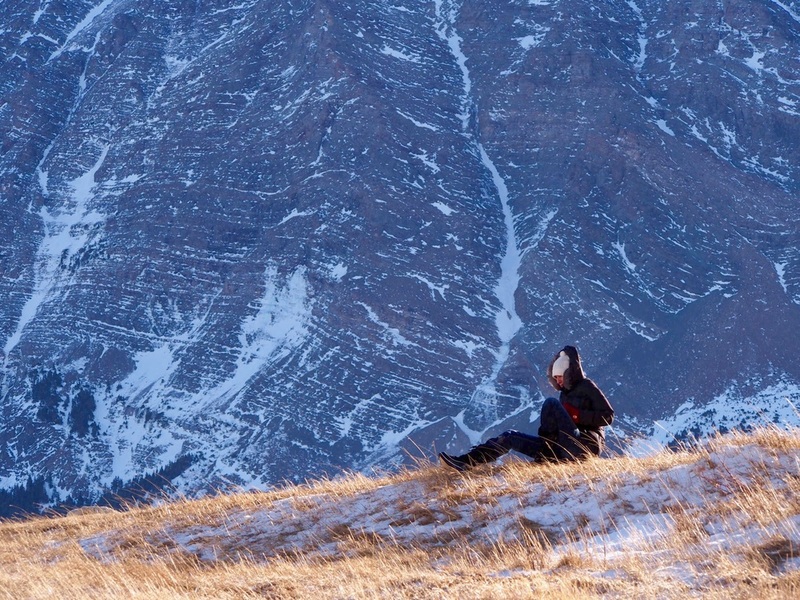 It was around this time we realized that Waterton is deserted in winter. Shops are closed and boarded up and most people have left their cottages. We drove through the town nearly alone. Anyone else we saw seemed just as amazed at the emptiness as we were. A little research beforehand would've told us Waterton shuts down in winter but our spontaneity got the better of us. The lake in Waterton felt more like an ocean when we got to the beach. The wind was creating some impressive waves that crashed against the shore. A few of them looked like they were flash frozen. We started picking up snow, throwing it and then watching where the wind took it. Dad wanted to see how far the Akamina Parkway went in winter. It's a winding road that goes out of Waterton and leads to the nearby Cameron Lake. 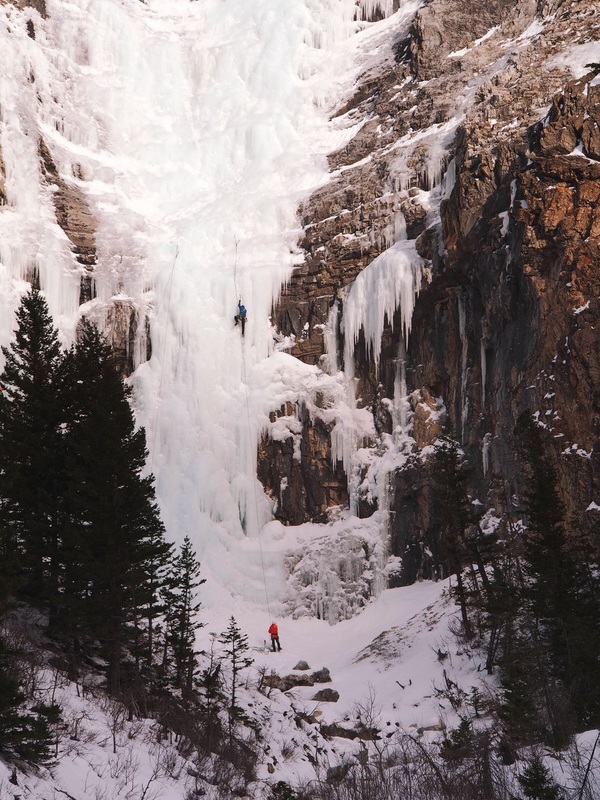 Along the way we saw ice climbers scaling a waterfall. A few other cars were stopped and watching from the road. I had some video from the day so I put together a collection of hyperlapses, slo-mo footage and evidence of just how windy it was in Waterton.